which I unpacked and assembled earlier today (video to follow). (1) a small manual (four pages in Englisch, the rest of it is written in various other European languages). (2) The two main horizontal bars and two t-shaped feet for each horizontal bar. (3) 12 screws, 12 washers. 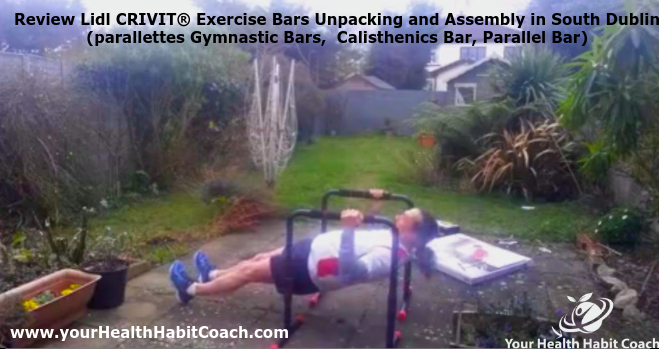 meaning you don’t need any other tools to assemble the exercise bars. (1) are very easy to put together, it only takes 5-10minutes maximum. (4) the horizontal part of the bars are padded with soft, thick bands to make gripping the bar more comfortable. (5) have rubber feet to prevent unwanted sliding or moving around. (6) measurements, dimensions are: 78cm high, 65cm wide, 47cm deep. 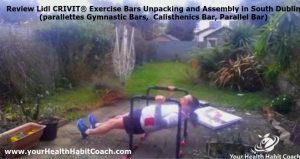 I used the bars at home for various exercises on a thick carpet and outdoors on a stone patio. The bars didn’t move or slide on neither surface, which makes them safe to use. There might be some restrictions for certain exercises depending on your height (I’m 5 foot, 9.3 inches or 176 cm) and could just about do tricep dips, without my bent knees touching the ground. The same applied to a “pull-up, rowing motion”, where I was just two or three inches, a small bit more off the ground when holding on to the bars with extended, straight arms. The manual shows you seven basic exercises with two simple pictures for each exercise and a very very short description of each exercise (mentioning the starting position and the end position for each movement). 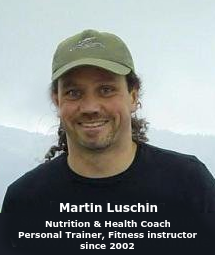 The exercise description doesn’t get into to much detail and if you haven’t done those type of exercises it won’t be of much value for you. The exercises include (I changed the names of the exercises, as the exercise description are not very descriptive, they are rather confusing in my opinion. It read a bit like a non-fitness person wrote that manual, very odd). (7) Straight-Arm Side-Plank – Static Hold with lower leg lift ( shoulder stability and strength, oblique / core strength, adductors). 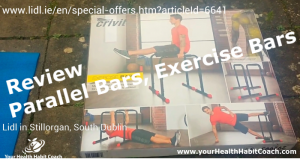 Lidl’s Exercise Bars are solid and sturdy, easy to assemble and for €34.99 you can’t really go wrong (except if you are rather tall, as you might not be able to do some exercises without your knees or legs touching the ground). 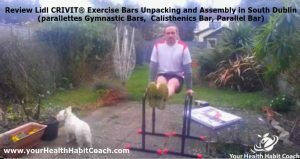 I would definitely recommend these exercise bars, having used them a three four times in the meantime. I plan to post various short exercise videos in the next few weeks and months demoing different movements and exercises with these bars. 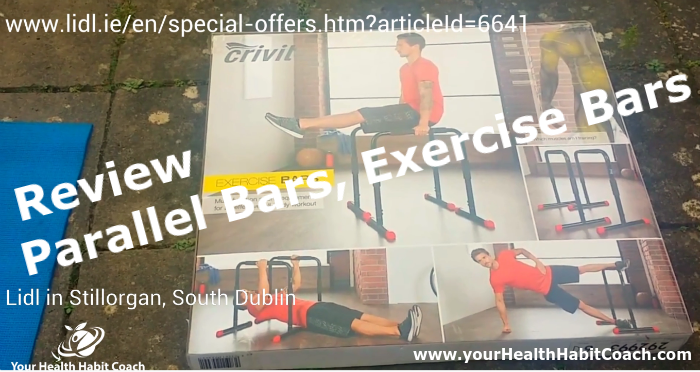 I looked up various other Exercise Bars, Parallel Bar and Calisthenics Bars on www.amazon.co.uk (make sure that the supplier delivers to Ireland, as not every Amazon.co.uk supplier delivers to Ireland, but you might try to use services www.parcelmotel.com ). Most comparable bars were much more expensive on www.amazon.co.uk, prices ranging from £34.99 to £54.99 or more, plus you would have to pay postage and packaging as well. I hope you found this review useful. Let me know what you think and if this review possibly made it easier for you to make a decision whether to buy or not buy these exercise bars. This entry was posted in Fitness Equipment, Reviews and tagged Body-Weight Bar, Calisthenics Bars, Fitness Equipment Review, in Dublin 18, in Ireland, in Leopardstown, in Sandyford, in South Dublin, Lidl Exercise Bars, Martin Luschin, Parallel Bars, Parallettes, Review on February 3, 2018 by admini.